Product #80 | SKU ZM-3 | 0.0 (no ratings yet) Thanks for your rating! 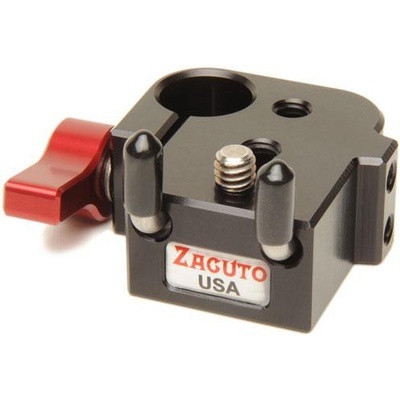 The ZicroMount III from Zacuto is used to mount any device with a ¼ 20” or a 3/816” inch (with a ¼ 20” to 3/8 16” adapter) screw hole. The Zicromount III is screwed into the bottom of the device such as a monitor and mounted to any 15mm rod, threaded articulating arm with Zacuto ZUDS or Zamerican Arm. The Zicromount III has the ability to attach to the device using two screws. The Zicromount III also has L shaped claws to prevent devices from turning and unwinding. By adding an optional camera pin, the ZicroMount III can be used as a mini Baseplate for small cameras, allowing for quick-release onto tripods and Zamerican arms for press conference shooting.